Shannon and Ian Rentsch (#33 Jimco Aussie Special Nissan 3500cc) have been crowned Kings of the Desert once again, claiming a record-breaking sixth title at the 2018 Tatts Finke Desert Race. The son-father duo from Warrnambool, Victoria, completed a lights to flag victory, maintaining the top spot from Prologue through to Finke and back, to take the coveted win in 1 hour 48 minutes and 39.5 seconds today. “We had a good run down, really clean. This year it was a massive advantage starting on pole,” Rentsch said. After starting second this morning, Iron Man hopeful Toby Price’s run came to a premature end when mechanical failure ruled him out between Mt Squires and Bundooma. This is the second DNF in a row for Price and navigator Jason Duncan (#487 2017 Geiser built 6L V8 Chev 360cc). “I had no idea others were dropping off behind. Toby was only three minutes behind us this morning and I knew he’d be pushing pretty hard. 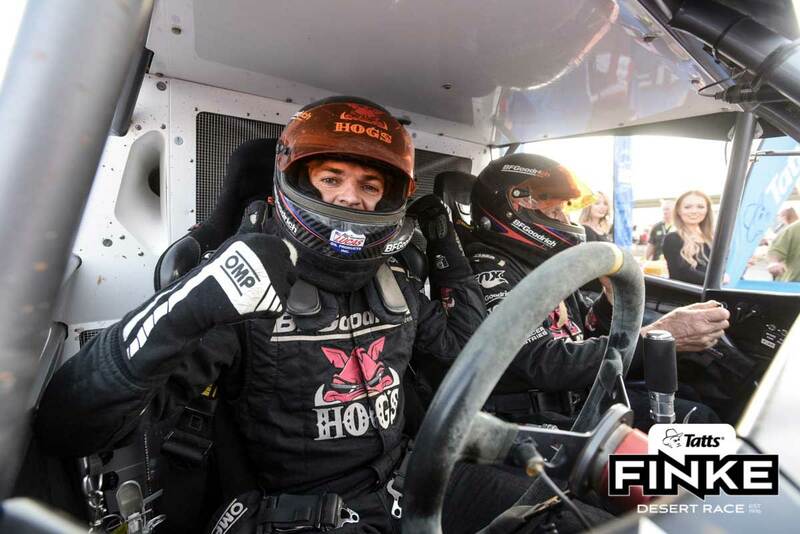 His truck handles really well in the rough stuff so we just set off going as quick as we could,” Rentsch continued. Five-time winner David Fellows with Greg Rhodes and Mark Bergamin (#492 Geiser Bros Trophy Truck Nissan 3500cc) followed the Rentschs in second place, crossing the line 16 minutes and 47.7 seconds behind the leaders after starting third this morning. 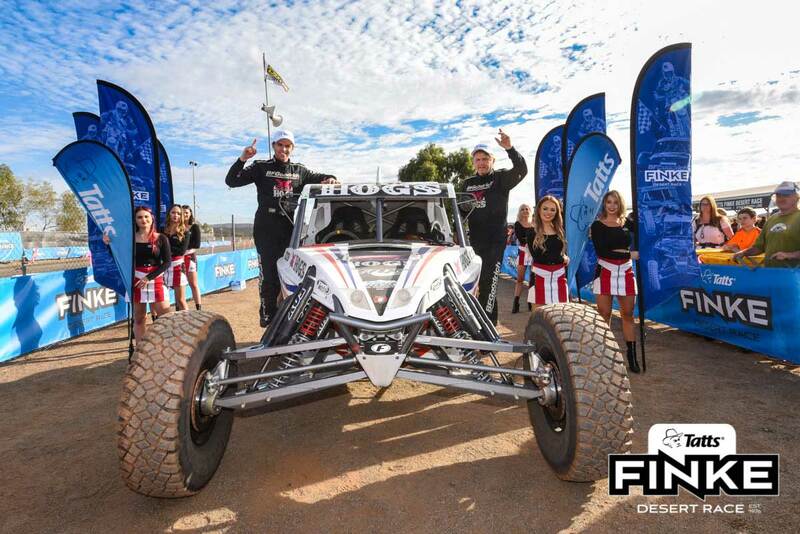 After rolling their buggy in Prologue, Jack Rhodes and David Pullino (#91 Jimco Aussie Special Nissan) impressively moved through the field today to finish in third place, their fourth podium finish in Australia’s toughest off-road race. Queensland’s Talbot Cox and Andrew North (#16 Racer Engineering Carbon Series Toyota 5600cc) arrived in Alice Springs in in fourth place this morning followed by Michael Marson and Chris Colbourne (#32 Racer Engineering Carbon Series Ford Windsor 6000cc) in fifth. 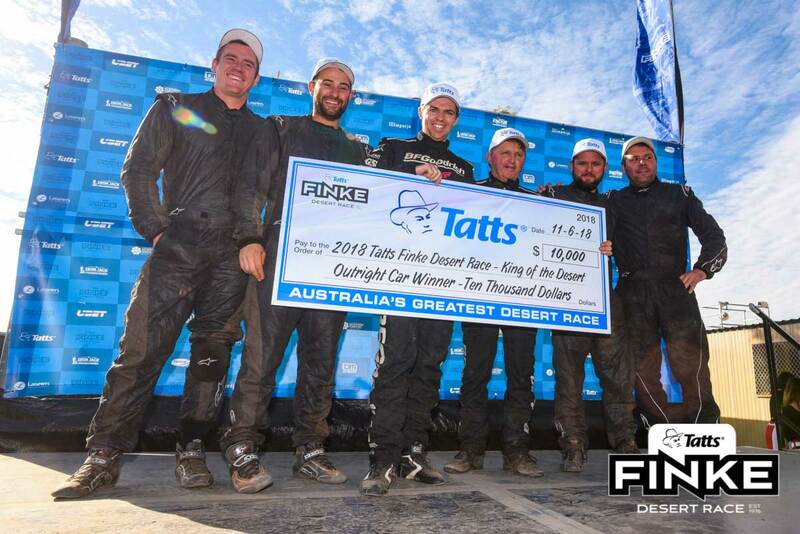 After finishing third yesterday, 2011 Tatts Finke Desert Race winner Greg Gartner, alongside Jamie Jennings and Mark Hannaford (#410 Geiser Bros Ford Raptor TT Ford 6000cc), also failed to finish due to mechanical failure.